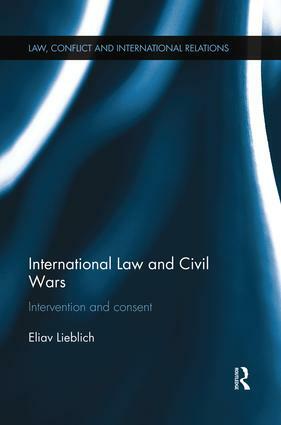 This book examines the international law of forcible intervention in civil wars, in particular the role of party-consent in affecting the legality of such intervention. In modern international law, it is a near consensus that no state can use force against another – the main exceptions being self-defence and actions mandated by a UN Security Council resolution. However, one more potential exception exists: forcible intervention undertaken upon the invitation or consent of a government, seeking assistance in confronting armed opposition groups within its territory. Although the latter exception is of increasing importance, the numerous questions it raises have received scant attention in the current body of literature. This volume fills this gap by analyzing the consent-exception in a wide context, and attempting to delineate its limits, including cases in which government consent power is not only negated, but might be transferred to opposition groups. The book also discusses the concept of consensual intervention in contemporary international law, in juxtaposition to traditional legal doctrines. It traces the development of law in this context by drawing from historical examples such as the Spanish Civil War, as well as recent cases such those of the Democratic Republic of the Congo, Somalia, Libya, and Syria. This book will be of much interest to students of international law, civil wars, the Responsibility to Protect, war and conflict studies, and IR in general. Eliav Lieblich is Lecturer (US Assistant Professor) at the Radzyner School of Law, the Interdisciplinary Center (IDC) Herzliya, Israel. He holds a doctorate from Columbia Law School. Since the end of the Cold War, the place of law in international politics has been hotly contested, even as in practice legal rules and actors have become increasingly important. Nowhere has this been more evident than in the role of law in armed conflict, peacemaking, and peacebuilding. This series will bring together cutting-edge, interdisciplinary scholarship on law, conflict, and international politics, encompassing the fields of international criminal law, international human rights law, and international humanitarian law, and law relating to the use of force, and conflict prevention, resolution, peacemaking, and peacebuilding, and resort to the use of force.